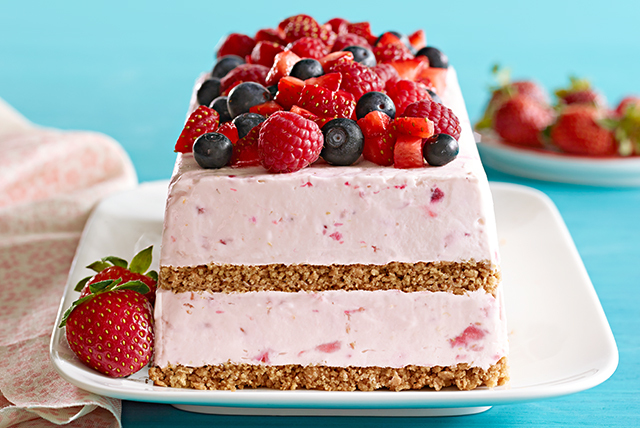 This frozen dessert has layers of buttery graham crumbs, a fruity filling and mounds of fresh berries. A no-bake sweet treat, perfect for summer entertaining! Mix graham crumbs and butter until blended. Microwave chocolate in microwaveable bowl on MEDIUM 2 min. or until melted. Mash 1/2 cup each strawberries and raspberries in medium bowl. Beat cream cheese product in large bowl with mixer until creamy. Gradually beat in milk. Blend in melted chocolate, mashed berries and zest. Whisk in Cool Whip. Spoon half the cream cheese mixture into plastic wrap-lined 9x5-inch loaf pan; top with half the crumb mixture. Repeat layers. Freeze 6 hours or until firm. Remove dessert from freezer 15 min. before serving. Finely chop remaining strawberries; combine with remaining raspberries and blueberries. Invert dessert onto platter; remove plastic wrap. Spoon berry mixture over dessert. Substitute fresh blackberries for the blueberries. Prepare using Philadelphia Light Cream Cheese Product, low fat sweetened condensed milk and Cool Whip Light Whipped Topping.